Clearly, gift cards are a big boon for business, which is why if you aren’t offering them at your stores, you could be missing out on a lot of sales and customers. Why are we bringing this up now? Because it’s October, and it’s only a matter of time before (more) people start asking for gift cards. A quick search on Google Trends will show you that searches for the “gift cards” ALWAYS ramp up in December. That’s why if you’re planning to sell them in your store this season, now is the time to prepare. Here are 6 pointers to help you market your gift cards and maximize sales. Display gift cards proudly in your stores to make sure customers actually see them. Put them on or near your checkout counter or set up displays in the “gift” section of your shop as well as any other the high-traffic areas. Fortunately, pulling this off is both easy and inexpensive. There are plenty of ready-to-use gift card racks, shelves, and holders that you can use in your store, and prices range from around $3 to $35. Want your gift card displays to have more personality? Consider going the DIY route. You can make your own gift card holders or racks and incorporate your store’s colors themes. 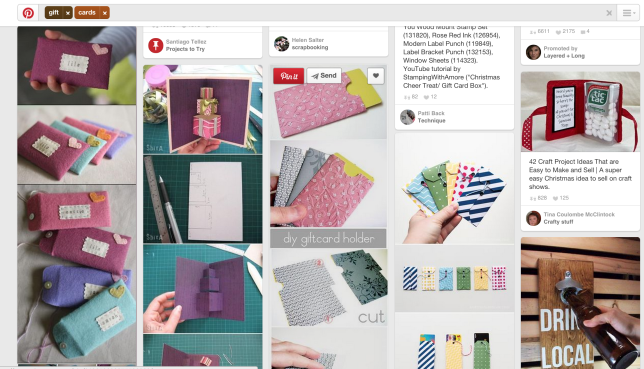 Check out Pinterest for these crafty gift card ideas. Most retailers adopt a passive approach when selling their gift cards. As Kevin Graff pointed out in a previous webinar, merchants often practice benign sales work when it comes to these cards. “They’re there, and if a customer asks for it, then they’ll sell it to you,” he said. However, Kevin notes that retailers have to encourage gift cards more. “It should be part of your add-on strategy,” he added. You can, for instance, start mentioning gift cards at checkout or suggest them to customers who haven’t made a purchase and are on their way out the store. The bottom line is that retailers have to be more proactive with selling gift cards. 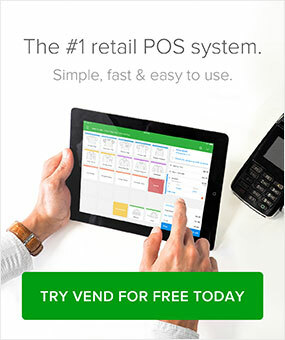 Once you do that, he says, you’re going to get a bump in the gift cards that you’re selling, and that all translates to more dollars for your store. Cover all your marketing channels when spreading awareness about your gift cards. In other words, if you’re communicating and marketing your merchandise to shoppers via certain channels, then you should communicate and market gift cards on those same platforms or devices. 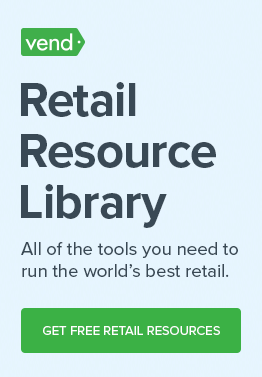 For a lot of retailers, these channels include physical retail, ecommerce, email, and social media. Now, we’ve already covered physical retail above, so in the following paragraphs, we’ll discuss how you can increase gift card awareness via your online store, email list, and social accounts. Invest a bit of time creating gift card-centric banners on your site so visitors are aware that you’re selling them. This is especially useful during the holidays when consumers are on the lookout for gift cards (more on this later). For the rest of the year, it would be helpful to have a permanent gift cards link on your site that shoppers can easily navigate to. Check out the Windsor website, which has a permanent “Gift Cards” on the footer so people can quickly purchase cards when they need to. Do you send out email newsletters or promotions? Why not throw in some gift card-centric content every now and then? Other retailers are adding permanent gift card links in their emails. Take Kate Spade, which has a gift cards link built into its email template. See if you can do something similar in your email marketing strategy. Check out our email marketing guide here for additional tips and insights on how to grow your subscribers list, increase engagement and make more sales through email. Make your gift card marketing initiatives more social by talking about them on networks such as Facebook, Twitter, Instagram, and Pinterest. For best results, use great-looking images in your updates when promoting your gift cards. You can, for example, post images of your cute card designs and displays or create custom images. Anthropologies does a good job encouraging people on Facebook to check out their gift cards. On December 23rd, the retailer published a post telling people who need last-minute presents that they have gift cards available. Over at Instagram, Dime & Regal, a store that sells handcrafted goods, recently posted a beautiful photo of their gift card. Consider doing something similar in your business. If you have gift cards in-store, snap a cute photo and share it on social media. If you have gift cards in-store, snap a cute photo and share it on social media. Just make sure you don’t overdo things. Promoting gift cards via social is great, but you wouldn’t want to bombard your audience with promotions by talking about them every day. As always, it’s best to have healthy mix of media and messages in your social media calendar. Consumers love giving and receiving gift cards, especially on special occasions. Not only are they the most requested gift item by consumers, but gift cards ranked number 3 in the list of items that consumers give out during the holidays. This is why it pays to invest in occasion-specific gift cards. In addition to the general cards that you offer, you should consider designing or creating gift cards for special events such as birthdays, Mother’s Day, Valentine’s Day, etc. Take Starbucks, for example. This year, the coffee company released limited edition Mother’s Day gift cards, complete with matching boxes to store them in. Depending on your store, there are some occasions that you should pay more attention to than others. For example, if you’re selling merchandise for babies and kids, then you could create gift cards for baby showers or kids’ birthdays. Running a men’s clothing store? Consider stocking up on Father’s Day gift cards. When marketing and advertising gift cards, don’t just think about your target customers; also consider the people who would be buying gifts for them. For example, if you own a spa, then you might consider targeting husbands looking to purchase gifts for their wives. This is a great tip to put to work when you’re running ads. Say you’re advertising on Facebook. Instead of just focusing users who belong in your usual customer demographic, think of people outside that group who may be gift shopping, and then target them. Run a few tests on this approach and see what works for your business. See if you can get some gift card shelf space at other locations. Contact local retailers (preferably those that complement your products) and see if you can strike up a deal. Perhaps they’ll agree to market your gift cards if you display theirs in your stores. Also consider getting in touch with regional chains such as grocery stores to see if they’d be willing to sell your gift cards. Do note however, that the other party may take a significant chunk from sales, so only take this step if it makes sense for your business. One of the biggest mistakes retailers make when it comes to selling gift cards is failing to market them. Remember, many people won’t automatically buy gift cards just because they’re there. To really make the most out of these cards, be more proactive about putting them out there and continuously refine your efforts. Got any other tips or insights when it comes to gift card marketing? Let us know in the comments.